Wearing a really simple shift dress to make my awesome shoes take the main attraction. 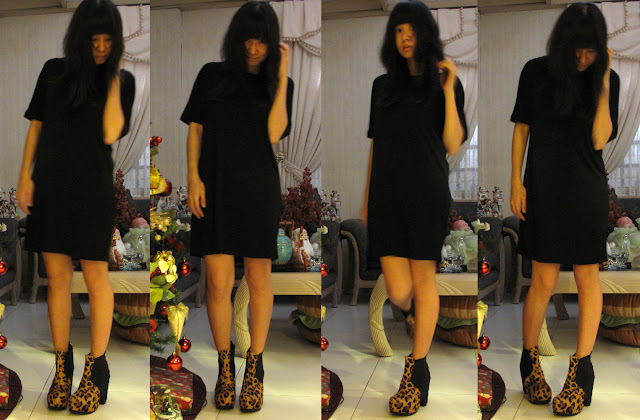 Don't you just love platform booties? I got these from Virtual Mae. This pair are really comfy and I super love how rockin' they are! I swear I'm so addicted to shoes! Would you believe that I'm actually running out of clothes to wear? My walk-in closet is in shambles and I'm still too lazy to clean it up. It's so hard to dress up every morning when all your clothes are on the floor instead of inside their respective cabinets. Sigh. I really need to set a day for closet clean up. I LOVE your platform booties! !^_^ so furry too! hehe. And Eli looks SO adorable!! You dress really well. You look great in the dress and the shoes are just... breathtaking. Haha. love this look. simple lang ang moda. you look great as always. your platform booties rocked my socks!!! i'm new to your blog and i'm loving it. And I can't believe you're running out of clothes to wear! Hehe!